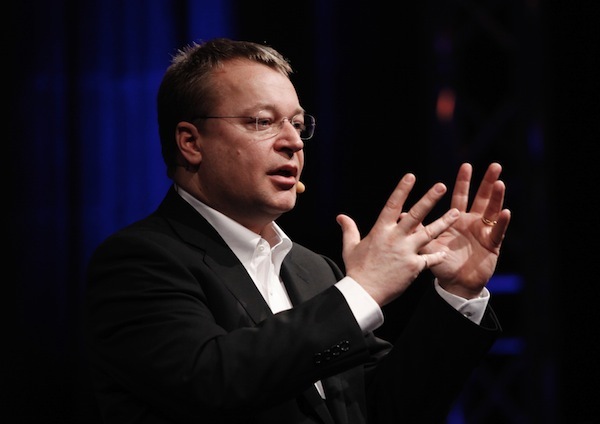 Has Stephen Elop doomed Nokia? The N9 and N950 clearly show that Nokia had good smartphones already in the development pipeline, but new CEO Stephen Elop never gave them a chance. He bet the company on Windows phone, which will be good for Microsoft but not so great for Nokia. Analyst predictions tell the story, in the simplest way. As measured by operating system, IDC predicts that Symbian will go from 20.6 percent global market share this year essentially to zero in 2015. Meanwhile, Windows Phone -- Nokia's new primary mobile operating system -- will reach 20.3 percent in four years. That's less than a zero-sum gain, since Nokia isn't the sole Windows Phone distributor. Granted, Nokia's global handset market share was falling fast before Elop left Microsoft to be Nokia's chief executive in September 2010. It's clear now that a distribution deal with Microsoft was top agenda nearly from the start, if not before he assumed the position. From a marketing perspective, Elop has to be about the worst thing ever done by Nokia. He wrote in an early February memo to Nokia employees: "I have learned that we are standing on a burning platform...We poured gasoline on our own burning platform...Nokia, our platform is burning". The only thing burning was Elop's desire to cut a distribution deal with his former Microsoft master, CEO Steve Ballmer. The burning platform memo should be a university case study required for all MBA candidates. It shows exactly what a chief executive, especially a new one, should never do. The burning platform spiel generated the wrong kind of news and buzz about Nokia and its future. In business, perception is everything. Yet Elop contributed to the perception that the global leader in handsets and mobile operating systems was a failure. He fed the fire of hype burning behind Android and iPhone. If anyone lit Nokia's platform afire, it was Elop and his negative memo that spread more FUD -- fear, uncertainty and doubt -- about Nokia's future than any competitor ever could. Elop isn't the harbinger of positive change but negative perceptions. What confidence does his leadership convey to Nokia customers, developers investors or partners -- or boost the morale of employees? CEOs are supposed to bring hope, instill confidence in the company, not spread uncertainty and doubt about the future. But Elop has done little else since taking over Nokia -- and it's his seeming obsession with Windows Phone as the last hope as core problem. The plans to scrap MeeGo and Symbian, the outsourcing of Symbian that also includes 7,000 layoffs, the Microsoft deal and Elop's ongoing statements to the media all continue to generate uncertainty that Nokia -- still the global handset leader today -- is anything but. Perception is everything in business. Even last week, while gadget bloggers and reviewers cooed over Nokia N9, which will run MeeGo 1.2, Elop made counter-marketing statements, making clear that a successful N9 would still be the end for MeeGo. Elop's problem is leadership. He hasn't demonstrated nearly enough, and there Nokia's board is at fault for making him chief executive. Elop's idea of leadership is selling Nokia's soul to Microsoft and essentially letting Ballmer and his team take responsibility for software, services and crucial future research and development. It's a pitiful situation. 1. Expand Nokia's strategy of making dumb phones and feature phones smarter. Nokia's core market wasn't, and still isn't, smartphones, particularly in markets like India where until recently market share was about 70 percent. The company had already embarked on a strategy for bringing smartphone features to other handset categories. The concept was right, but the execution needed refinement, starting with moving new products to market faster (see #7). 2. Release some truly competitive smartphones -- not just hardware, but software and services. Again, the N9 and N950 show that Nokia was finally on the right track. Take a look at last week's tech blogger and reviewer N9 write-ups. They nearly universally are: "Wow, I'd buy this phone if MeeGo wasn't a dead end". Federal Communications Commission info on the N950 shows what an incredibly good smartphone it could be. N9's muted enthusiasm shows that with the right marketing, and more importantly support from the chief executive's office, there was a hit in the making -- and one capable of turning negative perceptions positive. 3. Improved sync and services. Synchronization is the killer application for the connected era. But Nokia didn't get sync, or supporting services like contacts and mail, right. Ovi was good in concept -- not execution. But the April deal with Yahoo, for bulking up Ovi services was move in the right direction. I hear lots of complaints about how Nokia does good hardware but not software. Actually sync and cloud services are the problem, and it's one easily solved through the right partnership if not refocused development. 4. Reignited cameraphone marketing. Nokia has long shipped simply the best cameraphones in its high-end feature phones and smartphones. Carl Zeiss lenses, LED flashes, physical shutter buttons and more distinguished Nokia cameraphones long before Apple shipped one iPhone. In a way, Nokia brought great technology to market too early. The market is ripe for what Nokia has got. 5. Worked with developers to produce newer and better localized applications -- social networking, too. One of Nokia's platform strengths: Applications and services broadly available for specific regions and languages, particularly in Europe and emerging markets in Africa and Asia. Nokia should have spent Elop's first nine months supporting developers. The apps would be important for holding onto existing customers and migrating them to smarter Nokia handsets. 6. Broadly pushed out a mobile money service quickly. The other killer application for the connected era is mobile money. Nokia already has a mobile money strategy/service. The company should have pushed quickly to spreading its mobile payment/banking system across the install base, also working with some of the truly successful services spreading out of Africa. 7. Shortened product release cycles. Nokia takes too long from product announcement to handset availability. See my story from last week, for more on this one. 8. Negotiated major US distribution deals for Nokia smartphones. Would this be so hard for a Canadian CEO to do? In doing so, do some aggressive Nokia marketing in North America. The point: These all were strategies underway before the Elop era. Nokia had already started to realign in the right direction. The company simply needed a leader who could accelerate plans and get products and services to market faster. Instead, Elop derailed the Nokia Express to get the train on the Windows Phone tracks. None of these existing assets could make a difference alone. They're all needed, with the right leadership behind them. Nokia hasn't got it.